Domaine Pierre Marchand et Fils is a family winemaker of 17 hectares, located in the village of Loges, in the communes of Pouilly sur Loire, Tracy et Saint-Andelain since 1650. Since they took over the running of the family domaine from their father in 1989, brothers Eric and Pascal have steadily introduced many modern techniques whilst preserving the family tradition which started in 1650. 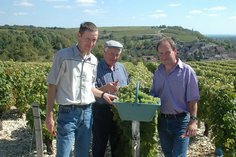 They have 9 hectares in the prime Les Loges area of Pouilly Fumé in the Loire Valley. The area is well known for the quality of the flint rich silex soils that impart a unique minerality to the wines, adding structure to the Sauvignon Blanc grape variety grown here. The top three cuvées are blended together to make the final blend “Les Loges”, a process that adds depth and complexity to the wine. The grapes were harvested in September 2015. Settling 12 hours cold, Fermentation - 15 Days in temperature controlled vats at 18°c. Racking - December 2015. On the nose this Pouilly fume expresses notes of exotic fruits and passion fruit. Then after aeration the wine opens up with notes of white flesh fruits. The attack is supple with a wide mouth and a good balance, with hints of peach and crisp gooseberry. It has a long finish with good complexity and minerality.